Is it going to be a movie? Nope. But things get flipped turned upside down when one of the girls turns up dead (oh noOoOOooO). Now the women of Wysteria Lane some random street in a wealthy Connecticut suburb have a real life mystery on their hands and Sofie is determined to solve it. As her investigation deepens, the secrets of suburbia quickly start unraveling like a sweater off the clearance rack in Forever 21. Short and sweet and a decent read. Intriguing enough that I kept want to read to find out everyone’s secrets and whodunit, but not as exciting or shocking as other mystery books (like Gone Girl). It’s a lot more Desperate Housewives than Agatha Christie which didn’t thrill me. I was hoping for more of a mystery thriller with a jaw dropping twist ending, but instead got a lot of suburban gossip with a mediocre ending. I love Desperate Housewives, so I probably would have liked it more if I knew that going into the book (but even so, it’s still not nearly as good as DH). Sure, I would recommend it but not emphatically. You can get a copy at Thriftbooks or Amazon. 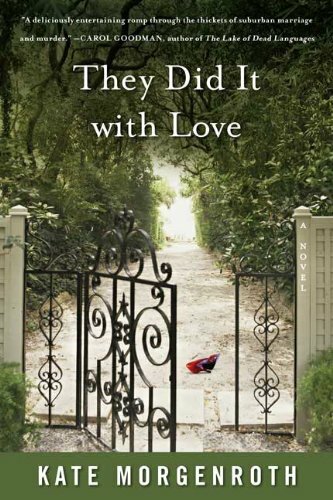 This entry was posted in Book and Movies, Book Reviews and tagged book blog, book reviews, mystery, mystery books, They Did it With Love, They Did It With Love book, They Did It With Love book review. Bookmark the permalink.